High on the list of many children’s (not to mention grown up’s) wish lists is a ticket to one of the Warner Brothers Studio Tours. While it’s guaranteed to be a magical and memorable day out, knowing exactly what to expect will help you get the most out of it. Tickets need to be booked online, as they’re not available to purchase on the day. Each tour has a maximum capacity and a specific start time. Other than this, there are a few other key elements of the tours that will be useful to know, so take a look at this ‘need to know’ checklist and get up to speed before your visit. Nearly every tour sells out, so there may be long queues and big crowds at the studios, but don’t panic! If you have your tickets to hand, you won’t have any issues getting in. 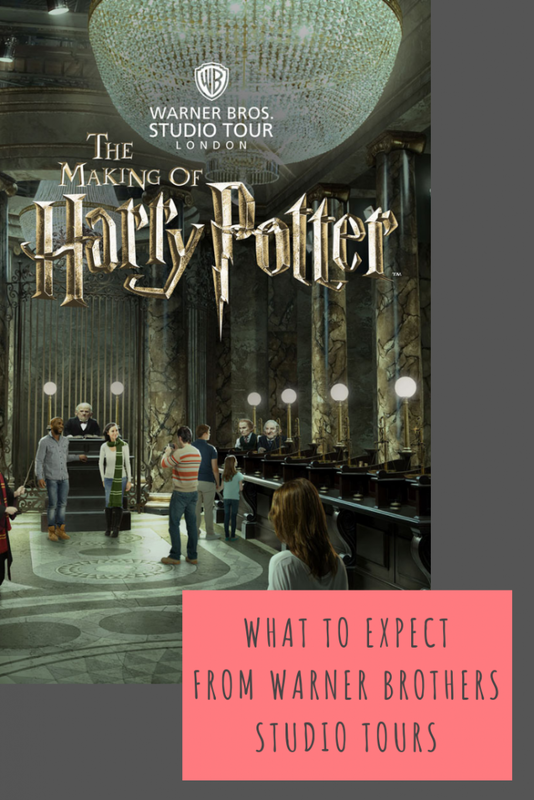 Once the tour begins, you can choose your own route through all of the exhibits and the studios are generally large, spacious areas, so the initial queues will quickly be forgotten. You can meander at your own pace, go back on yourself and swing back around to popular displays if you want to see them once they’re quieter. You won’t have to follow a prescribed route or shuffle along in single file. You’d be forgiven for assuming that all of the costumes, props and iconic items from the films would be displayed behind thick glass, but, in fact, they’re not. Thanks to the experience being housed in working studios, there is a sense that you could reach out and touch everything. Although this isn’t possible, thanks to waist-high barriers, you can get a lot closer than you might expect, which provides quite an intimate experience. There are a number of hands-on exhibits, dotted around the tours for you to enjoy. Green screen broom-riding and posing for ‘wanted’ posters are two of the most popular, along with buckets of fake snow that reveal how Hogwarts was made to look so magical and wintry. You may walk into one of the tours believing you know almost everything there is to know about Harry Potter and his magical world, but you’ll leave with so much more knowledge. Being able to get close to the original costumes gives you a whole new understanding of the way the characters moved in them, and there’s also a dedicated special effects department, which will teach you much more. With models of magical creatures, original design sketches and short films showcasing interviews with members of the special effects team, you’ll finally know the secrets behind how certain scenes were created. Now that’s magical! The Harry Potter books may have originally been written for children and young adults, but that doesn’t mean that the studio tours are only for youngsters. Take a look around when you arrive and you’ll probably find just as many groups of adults and couples as there are children. Anyone who has enjoyed the films will have an incredible time on a Warner Brothers Studio Tour, regardless of age. What’s more, none of the activities are age-specific. If you’re in your 30s and fancy riding a broom, you can. Of all the weird and wonderful foods in the Harry Potter films, you can actually try a few of them in real life! Thankfully, the Puking Pastilles aren’t on offer, but Chocolate Frogs, Fudge Flies, Peppermint Toads and even Bertie Bott’s Every Flavour Beans can be enjoyed, as well as the most iconic drink in the series: Butterbeer. Around halfway through the tour, you’ll come across Backlot Café, where you can buy a frothy Butterbeer and try it for yourself. There’s also Butterbeer ice cream on offer. Both are delicious and will add to the whole experience. Finally, be prepared to want to invest your life savings in goodies from the gift shop. You might have already planned to pick up a few things, but when you see the array of souvenirs, edible treats and Hogwarts merchandise, you’ll be blown away. The house uniform items are particularly popular so make sure that everyone in your group has been sorted prior to taking part in a tour, so as to avoid buying the wrong clothing and accessories. Imagine what horror would ensue if a Gryffindor wore Slytherin colours! As you can see, there’s a lot more to the Warner Brothers Studio Tours than you might first think. So, before you pack the car to head to Leavesden, be sure that you’re really ready for a magical day out. I LOVE the Studio tour, I think I might have been about eight times now! The gift shop is the most dangerous part for me as I always spend ALL the money. In terms of being in a big crowd, I’ve been very fortunate where I’ve been to more ‘events’ where it’s quieter, but I also find going on a random Tuesday in the morning is much better in terms of crowds. I personally think Butterbeer is overrated… but that’s just me. This is something I really want to do! It sounds absolutely amazing and hands up I love Harry Potter, it’s just making it there now! As a big foodie, I know the food would be my favourite part. I’d love to try the Butterbeer! I’d love love love to do this, such a big Harry Potter fan I am! This sounds like a fab day out and something I know my whole family would enjoy! Its great that the displays aren’t “locked away” and that you can really get up close to them. I also love the sound of the interactive bits of the tour, my kids would love that! I’ve known a few people who’ve gone on these tours and always think they are fabulous!! SOOO what does butterbeer taste like?? We loved going and would really like to go again, the Butterbeer is amazing!